Alongside the Undines guiding people over water, and the Salamanders watching over the planet from the skies, there are the flighted Sylphs delivering packages. The four become complete with the Gnomes. There are typically two types of opening theme: the type you watch every episode, because the song, and possibly animation, are enjoyable, and the ones you skip because they are not. Then, there’s the Aria opening, different visuals each time, and the individual opening dialogue for each episode presented. These make it rather difficult to skip the opening, which isn’t a bad thing with this design. After watching the third episode, I felt this series was beginning to go somewhere. Not as a story, but as an existence. With episode four, it feels to have shifted more into an exercise in world-building. The episode was by no means bad (I enjoyed it for the most part), but the whole trip where the creation of Aqua is delved into feels almost like there’s more tell than show. Almost. Compared with Tour Guide Akari’s info-dumps on the locations around Neo-Venezia, I’ll take an episode where characters are told facts piece by piece any day. With Ami, we have yet another A-name. The attraction by President Aria for her, the bell, and the “ghost-like” feeling surrounding her (including the bright sunlight), and the age of the card in the letter easily gave away her true identity (more or less). Part of me wishes some of the clues were more subtle, so when the lady in the video said “Ami”, I wouldn’t be thinking, “Pick up your cat, now.” And yet, I don’t know what could have been done to improve on things. 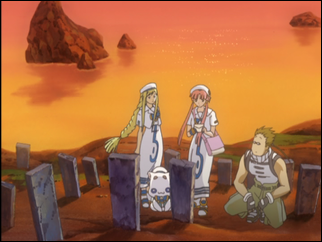 Before Akari leaves for the far-off island, Aika and Alice visit to check up on her. This shows that Akari is completely open in letting her friends know about her duty to deliver the letter and about where she’ll be going with it. Although unspoken, it hopefully gives Aika a little bit of time to get to know Alice, as well. For the credits, neither Ami nor Woody is listed in the English credits. Akari has her laptop that she wrote home on, and has been in contact with Ai via. It’s interesting to see the contrast of technology, as there are video photos, laptops, and flying crafts, but people travel by foot and by boat, and food products are prepared by the buyer. Even bicycles are not in this city (going by the bonus video where director Sato comments on cars and bicycles being not allowed in Venice). 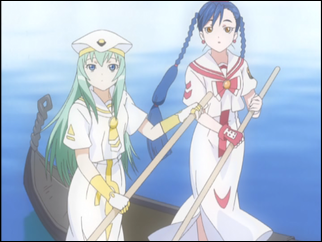 It’s as if Neo-Venezia (and perhaps all of Aqua) have taken the conveniences of communication, but shunned the conveniences of transportation. It makes for a unique and interesting feel to watch, a place people are able to talk with anyone, anywhere, anytime, but can only reach destinations in a leisurely fashion. 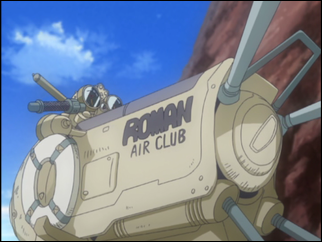 The exceptions to transportation by foot or boat would be the Sylphs, the cable cars, and the space crafts, none of which is used for common transportation (and even the gondola are likely used for recreation and tourism more than going to ones destination). Could Aria keep such a feel if there were roads with cars, vending machines for easy access of snacks, and other modern conveniences outside of the home?